Home » Activities » On Land » Khao Laem Mountain Trek. Awesome Views. What’s the Most Scenic Trek on Koh Chang? These pics were all taken in the rainy season in mid 2016 – hence the cloud. During high season you’re going to get far better photos. Big thanks to ‘Thomas’ from Thomas Koch Travel & Adventure who put the trek together. He only takes private groups so you won’t see tour agents selling tickets for his treks, like they do for the other trekking guides. This is so he can understand what his clients want and organise something suitable – whether it be an island tour or more adventurous trekking. He’s a very knowledgeable, experienced guide and you won’t have any communication problems. 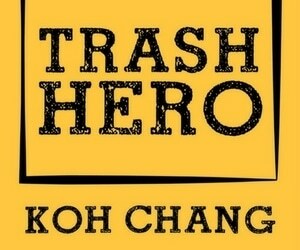 Visit his Facebook page for loads of photos & contact him direct if you want to see more of the real Koh Chang. Khao Laem is the 4th highest peak on Koh Chang. It’s located in the south east of the island. It’s not a peak that gets a lot of foreign visitors going up it, but it has been popular for years with Thai groups who often camp overnight near the summit in order to see both the sunset and sunrise. I’m adverse to spending the night anywhere without a minimum 2* star rating, so a day trip was enough of an adventure for me. There were five of us in the group which included myself; Swiss expat Rolf; Nui – Thomas’s friend and avid photographer & a young Thai couple who love nature, had never been to Koh Chang before but rode a motorbike overnight from Bangkok in order to do the trek after seeing photos on Facebook. We were picked up early morning by Thomas and headed round to the east of the island. First stop was at a small coffeeshop, owned by a teacher in Salakphet school, where they grow & roast their own coffee – in very small batches. Only 40 Baht for a pretty good cappuccino. We also got lunch sorted out. This was provided by Thomas as were 3 bottles of water each. ( You’ll need to bring your own backpack and also any additional items you might need e.g. – towel, extra water, camera, swimsuit ) A raincoat, leech and bamboo trekking pole were also provided by Thomas. The starting point for the trek was the small parking area near Khiriphet waterfall. This waterfall is easy to get to by scooter, free to visit and has a couple of levels that are easily accessible and great for swim at this time of year. ( During the High Season, there will be very little water from January – April ). It’s 3.8Km from the starting point to the viewpoint near the summit with around 600 metres increase in altitude. Most of the walk up isn’t too steep. The toughest section is near the start, after around 15 minutes of walking on the flat there’s a very steep section that. By the end of the first kilometre you’ll be dripping with sweat – partly due to the walk but mainly due to the humidity. This is different from trekking in Europe in the summer where you walk all day and hardly sweat at all. The downside to wearing shorts, which might appear to be the best solution to keep cool, is that your legs will probably get bitten by some bugs and scratched by undergrowth. On the way up we stopped a couple of times for water breaks. Once at the huge tree where you can live out your Tarzan fantasies and then again after another steeper than normal stretch near the shoulder of the hill. The only time scrambling up rocks is required is 15 minutes before you reach the top where there’s a short rocky section that you’ll need to use your arms to pull you up. A few metres before the viewpoint is an area that’s been cleared and is used for camping. The viewpoint itself is a rocky outcrop – with no tall trees – hence the opportunity for great views. This isn’t the summit of Khao Laem that is another 15 minutes walk away. There aren’t any views from the summit itself. We spent quite a long time at the summit, waiting to see if the cloud cover would break and they’d be some sunshine. Whilst bright sunshine will make for much better photos, it means that it will also be very hot up there. Much more comfortable to have cloud cover and not get sunburned to oblivion. All the small things . . . it isn’t just about the views. During the trek Thomas pointed out many things that ordinarily myself – or anyone who doesn’t know what to look for – would miss. For example, the shedded skin or a cicada; a multitude of different orchids; different types of ferns including one that until recently had never been found anywhere outside the south of Thailand; flytrap plants; a caterpillar that’s built protective ‘force field’ around itself; soil trampled by tens of thousands of termites. There are two ways to get back down. The quickest and easiest is to simply follow the same route you used to get up there. This is what most visitors do. But there is another way that takes longer, has some steep, slippery descents, but means you see some different views on the descent – so we took that one. From the viewpoint there was a bit more uphill walking to be done to the top of Khao Laem, which is marked by a small emerald Buddha statue. From there on it was pretty much all downhill, with just one short incline when we came to the turn off for Khao Yai ( the tallest mountain on the island ). This is another 90 minute – 2 hours walk to the summit, so there isn’t time to do both in the same trek. As with the ascent, the descent follows a ridge half of the way and the steepest section is in the final half where it;s handy to have a rope to use to help stay upright on some sections. The ground was damp, not muddy, but even if it was dry care is required as would be easy to slip and slide 10 – 20 metres or so down. Highlights of the downhill leg were the view northwest towards Chai Chet and the north end of Klong Prao beach. And further down when you could hear the roar of a hidden waterfall. The top was just visible through the trees but impossible to get to without hacking a path through the jungle. That waterfall doesn’t have a name, although it’s the highest level of Khiriphet waterfall and may well have a drop of 100 metres or so. The route down ends a 2 minute walk from the falls at Khiriphet. So it was time to have a late afternoon swim in the cool, clear water before getting back in the van and heading home. All in all a great day out. And a trek I’d definitely recommend anyone who’s reasonably fit and likes a bit of an adventure to try. To arrange a trek: Contact Thomas through Facebook. During High Season, you’ll need to book well in advance. February 2018 – I was planning to go to explore Khiri Phet waterfall and see if I could get to the upper levels but then, as it was a cool, cloudy day, I decided to go up Khao Laem on my own. The trail was very easy to follow to the top. And from the top I took the same route down as I did on the guided tour with Thomas, described above. Unfortunately my Garmin watch switched itself off on the way up, so I don’t have a complete record of the route or time. But doing it alone took under 3 hours – based on the time I took the first photo at the start to the time I took the last. On the way up I had a couple of 5 minute breaks to catch my breath and then only spent about 10 minutes on the top as I wasn’t sure if it would rain or not. I don’t advise doing the trek without a guide unless you are used to jungle trekking and have water and a phone with you. You’ll get a mobile phone and 4G signal on most of the way. Short video of the view which I posted on Facebook. The red ‘x’ is for the runners of the recent trail race who came up the hill. They did U turn on the top and ran down the same way. March 2019 Update. I do this hike every couple of months for fun – it is still my favourite trek. You don’t have to be superfit to do it but if you aren’t used to walking in the heat it will be a challenge. Last year I took our staff up there. They needed a few stops on the way but made it to the top in time for lunch. If you’re planning to do the circular route, then you need to leave the viewpoint before 2pm to be sure of getting down before it starts to get dark. There’s not much light in the jungle and you’re in the shade, with the sun behind the mountain on the way down. So you want to be back at the foot of the hill by 5pm. And during March 2019 the National Park began marking out the trail, so that anyone will be able to do the hike solo without a guide and without (hopefully) getting lost. There is apparently also a plan for some of the locals to act as guides to take people up the hill. In theory this is a good idea, it provides them with some income from tourism. But in reality most of the wannabe guides don’t speak any English and don’t know much about the flora and fauna. Their skill is in already knowing the trails in the area. So that’s not ideal if you want to learn a little about the surroundings and jungle during the hike. Khao Laem is an amazing place for some good photos and is a beautiful trek, I recommend this place to everyone who will be visiting Koh Chang. The coffee place you metioned sounds interesting. Could you provide the detailed location. Furthermore, I would like to know if it is still allowed to camp on top of khao leam. If you’re going straight up from Khiriphet, then if you continued past the ‘X’ from the trail run you’d end up at the top of Khao Laem and then at the viewpoint where I took the photos. I’ve got the GPS route for the place you went to with similar views, but not tried it. Wasn’t sure how easy to follow the trail was now. It’d be good if somebody could get a map of Koh Chang and label the different peaks properly because it’s confusing. Isn’t Khao Salakhpet the highest peak on the island? Which is Khao Yai? I did this trek again starting from Khiriphet Waterfall and walked up about an hour or so where you come to a right turning or a straight on. The straight on has one of those red crosses. The right turn takes you to a viewpoint with the same sort of view as on your photos but not with the same rocky outcrop. So I don’t know, maybe the straight on is that viewpoint. There are a few peaks around there and it’s hard to figure out which is which when you’re standing on them. It doesn’t really matter I suppose as long as you get to a good view but I like to know where I am. I’ll use a GPS next time. By the way I did the 70km and there was no u-turn like that one in your photo on the course. I think that must be on the 100km route. The only u-turn on the 70km race was the one half-way on the road to long beach. They should really take them down between races, but the red and white banners everywhere make doing the trails really easy. There are a few good trekking guides eg Tan Trekking or Klong Kloi trekking. If you want a private guide to take you around the island I don’t have any specific recommendations. But you’ll be able to book one at most tour agents. Any other recommendations for guides? Thomas is booked for my time already and I have found limited options on-line. I’m not sure if I took the exact same route, but I ended up at a (in my opinion) better viewpoint where you could see practically all the southern islands, including Koh Mak, Rang, Kood, Wai, Khlum. If I had to guess I would say I went the same way as you but stopped about 20-30 minutes earlier. You look to have walked further than I did, based on the angles of your photos. The leeches were a pain. Try and wear tights or something, even if you’re a guy.